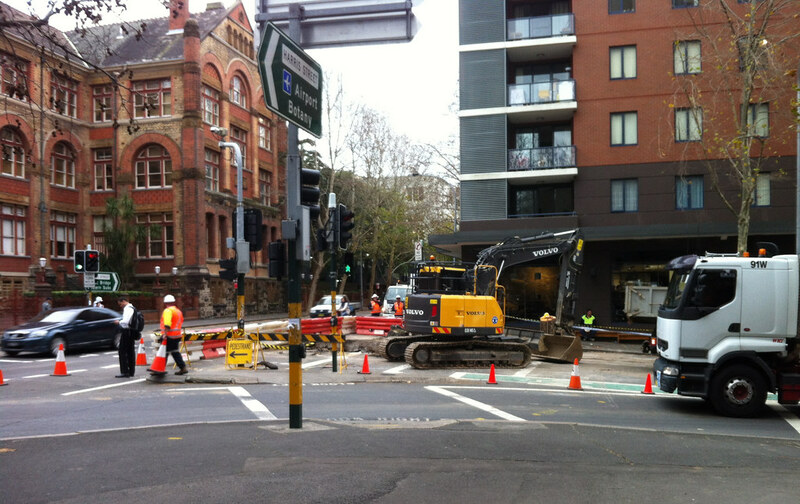 Yesterday, I blogged about a burst water main affecting some buildings at UTS. Turns out our course coordinator had misread which buildings were closed, so Clara and I were still able to go to the Network Security lecture. Staff at UTS have been working non-stop to look after the students lodged in Yura Mudang and protect our critical infrastructure. Staff have also been working closely with Sydney Water and Energy Australia to restore services to Buildings 5 & 6. I’m pleased to report that Yura Mudang is once again open to students, some of whom spent last night in the Multi-Purpose Sports Hall (it really lives up to its name!). I’m sure all the students sleeping on mats on the floor appreciated the tone of that message. Walking back from class, Clara and I got to see the roadworks above what we assumed to be the area above the incident. A truck to the side was offloading some pretty impressive piping; judding from the scale of the operation, the rupture must have been huge. We’re now being told Building 5 classes on Tuesday and Wednesday will continue to be cancelled, the library remains closed, and that WiFi will continue to be patchy. Here’s hoping this all gets sorted out soon.